My next 10 picks could make you richer in 2019! Hard to believe? See for yourself and then decide. I don’t know how much money you’ve made last year but I do know this: My readers have banked 228 winning trades in 2018. All thanks to my scientifically developed, time-proven OptiMo Trading System that doubled our readers’ money year over year. What, exactly, is the OptiMo Trading System? It’s the most scientifically advanced, momentum-based stock picking System that’s ever been developed. Its results speak for themselves. Take Advanced Micro Devices (AMD), for example. Our OptiMo Trading system identified this stock as a screaming buy in June. As a result, our subscribers grabbed a 113% profit in 3.5 months! If you had invested just $10,000 in this stock, your stake would have jumped to more than $21,300! Carvana (CVNA) was identified by OptiMo Trading System in May. Investors who followed this buy recommendation grabbed a quick 167% profit in just 4 months! If you had invested $10,000 in this stock, your stake would have jumped to more than $26,700! Twilio (TWLO), is another example of how our OptiMo system identifies stocks at the beginning of a big breakout. If you had added this to your holdings in February, you would have grabbed a 130% gain six months later! And those are just three of the 228 winning trades that OptiMo identified that banked big gains in 2018, beating the market multiple times! 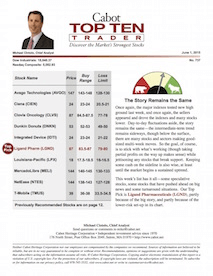 • Our OptiMo Trading System identified Okta (OKTA) as a BUY in February. Subscribers who bought it when we recommended it have also grabbed a 121% gain in just six and a half months. • Then there’s Stitch Fix (SFIX), which is in boom times thanks to its innovative personal shopping service. The stock was featured in Cabot Top Ten Trader on June 25 and rose 93% 2.5 months after it was recommended! • Or look at Teladoc (TDOC), which was identified by OptiMo as a buy in May. Our readers who grabbed it with us are looking at a 65% gain in just under five months! This is why Cabot Top Ten Trader has become one of the most talked about trading advisories on Wall Street. Many of these trades were banked in a few months, a few delivered these profits in weeks and others we held for over a year. While you can’t go back and grab those profits, it’s not too late for you to grab this week’s winners. I’ve made it easy, affordable and risk-free for you to do just that. That way you can see for yourself how easily you can bank 10%, 20%, 50% profits in weeks. In fact, I’m so sure that you’ll bank big profits, that if you don’t grab 10 double-digit winners in the next 30 days—you won’t pay a dime. How can I make such a guarantee? Easy. Our scientifically developed, fully computerized, momentum-based stock trading system identifies Wall Street’s fastest-moving stocks days and even weeks before they explode. That’s the advantage that Cabot Top Ten Trader brings you. You get the market’s strongest and most profitable stocks on both a short-term and long-term basis, handpicked based on the fundamentals and best low-risk entry points. And that’s how we’ve not only doubled our readers’ money 15 times since 2002, but also outperformed the market. That’s why Cabot Top Ten Trader has become the #1 choice for thousands of independent investors like you. Investors who don’t have five hours a day to watch the markets, crunch the numbers or worry about when to take profits. OptiMo does it all for you, scientifically. It identifies what to buy, when to buy it and—most importantly—when to bank your gains. All via the pages of Cabot Top Ten Trader, published by the same people behind the Cabot Growth Investor—America’s most respected financial advisory since 1970! Our Optimo Trading System is seeing a lot of smart money flow into a number of select stocks, in advance of announcing positive forth quarter earnings surprises. Enjoying sizable increased volume by institutional investors. They match the trading signals that led us to 1,031% gains in Tesla Motors, 303% in Vipshop Holdings, 191% in Qihoo 360 Technology, 126% in Canadian Solar and 133% in Netflix. That’s what Top Ten does with uncanny accuracy: gets you into the trades before they break out. That, my friend, is just how convinced I am that this week’s trades will jump on fourth-quarter earnings and continue to pile on the profits. If I’m right, you’ll have banked another 10 big winners in weeks to come. Who Want to Scoop Up Big Short-Term Profits! That’s why we created Cabot Top Ten Trader a decade ago and geared it directly for our Cabot investors, like you, who know how profitable our time-proven technical approach is and simply want to begin to profit from the short-term trades the market can hand you. The results have left our readers smiling all the way to the bank, with annualized profits of up to 50% on each of our trades—coming in as little as 30 days—even with the losers thrown in. All by using the same time-proven Cabot technical system that doubled our readers’ money 29 times in 48 years—only to grab shorter-term profits. Just like Cabot Growth Investor and our other advisories, we do it all for you—without you having to do any kind of chart reading or calculations. Our crystal clear instructions will tell you what to buy, what to pay and which new trades to roll your profits into. That’s why you can buy them with confidence that they are poised to hand you big returns—all backed by our 100% guarantee. Again, you’ll get my complete instructions, buy and target prices and my complete rationale for making each trade. With next week’s economic and earnings reports set to drive them higher, this is not a situation you want to sit on. If they are just half as profitable as our most recent big winners, you will grab 30% to 50% gains in weeks ahead and you’ll never trade any other way. As your reward for taking action TODAY, you will receive a copy of my proprietary OptiMo trading strategy: How to Squeeze an Extra 50% Profit Out of Every Trade. In it you’ll find 10 ways to make more money on each trade—using the same time-proven Cabot methodology that’s been handing our readers up to 50% annualized profits in as little as 30 days. There’s No Way You Can Lose! In an industry where hundreds of financial advisories come and go, the Cabot name has stood the test of time for over 48 years, delivering market-beating results and money-doubling profits year after year using our time-proven technical system. That’s why when we launched our Cabot Top Ten Trader trading service, we promised our readers that they would profit from our fast-moving trades or they would not pay a dime. It’s the same promise we made back in 1970, when we launched our first publication that we have stood behind for more than four decades. This means if you are not impressed or delighted with the profits you make from our trades, just let us know during the first 30 days of your subscription and we’ll send you a 100% refund. If you are already a subscriber to our other publications, then you know we stand behind ALL our recommendations.The very same guarantee applies here too. Considering our track record, you would think it would cost you an arm and a leg to join us at Cabot Top Ten Trader. Our goal is to make trading profitable and affordable for you. That’s why you’ll be pleasantly surprised that our annual subscription is a shockingly low $397—that’s nearly 10 times less than what other trading advisories charge for trades that seldom pan out, as we hear from our subscribers. “>And again, with our 30-day money-back guarantee, you won’t risk a dime. A time-proven, technical trading approach for grabbing 30% to 50% gains in as little as 30 days. 10 trades sent directly to your inbox weekly, featuring the market’s strongest trades and precise entry points according to our winning methodology. Complete buy, sell and profit instructions on each one of our trades, along with our complete rationale for buying them. 24/7 access to our private Cabot Top Ten Trader website that includes a searchable archive of past issues along with numerous special trading reports designed to make you a better trader and investor. PLUS a complete refund if you’re not 100% satisfied with your results in the first 30 days. When I look at the market today, I see more potential (and more volatility) than I’ve seen in the past twelve months. Judging from the action that we’re seeing, nearly every one of this week’s Top Ten trades is set to announce great numbers, and the smart money is beginning to pile in. That’s why if you wait until after the numbers come out, the big profits will have passed you by. That’s why if you’re serious about grabbing your share of profits from these quick trades, now IS the time to join us. I guarantee you’ll never see a better deal or join at a better time, as the market is clearly headed up and our stocks are all set to break out. Again, with my money-back guarantee, you have nothing to lose and everything to gain. P.S. Don’t let this major profit opportunity pass you by.